When I first came to Mumbai, there were a bunch of us at work who were all from outside the city. Most of us lived in PGs and shared apartments around Bandra. We would often hang out together after work. Largely in South Mumbai. Churchill, Crystal, Leo's, Gokul, Bade Miya, Bachelors and so on. Once we went to a lane in Santa Cruz in the evening. A girl in the group who stayed there told us about a dosa cart there. We went to the cart and had a number of dosas that evening. 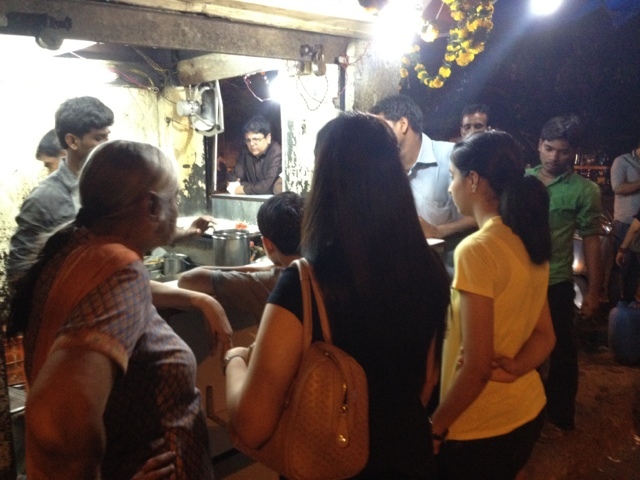 There were two Tam Brahm girls who got excited by the dosa feast. The rest of us, meat eaters, indulged them as they would gamely go to places chosen by us to eat in most cases. It's been a decade and a half since. I think I am the only one from that group still left in Mumbai. 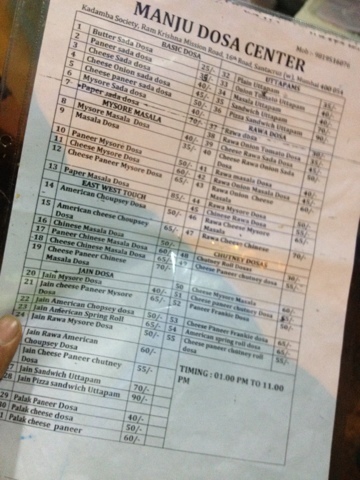 The dosa cart is gone I am told. The owner of the cart, Mani, closed down. 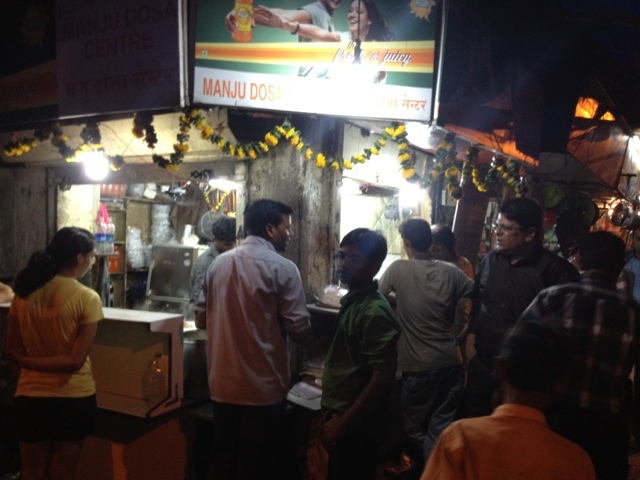 The cart resurfaced as a shop with some of his workers opening Manju Dosa Center at Khar, 16th road. I stopped there twice recently. Mysore sada first time and rava tomato onion this time. In fact wrote half this post while waiting for my dosa. I am enjoying this mobile blogging thingie. Brings back the spontaneity into blogging. Hope it works for you. The dosas were piping hot. Lip smacking. Well flavoured. Slightly crisp. Indulgent. Made with butter. Much better than Shiv Sagar stuff. The guys at Manju's originally hail from a place close to Mysore in Karnataka. I asked them why their dosas weren't soft like what I had in MTR in Bangalore. 'People in Bombay complain if the dosas are not crisp' they said. Yes, to survive in Mumbai you have to live by its rules. In any city for that matter. Most of the south indian restaurants in Mumbai (the ubiquitous udipis) are owned by Shettys from South Kanara (Mangalore / Udipi). The dosas there tend to be thinner and therefore crisper when spread on a tawa. The dosas in North Karnataka (Bangalore and Mysore) tend to be thicker which need a lot more oil to become crisp (like MTR makes its Masala Dosa). 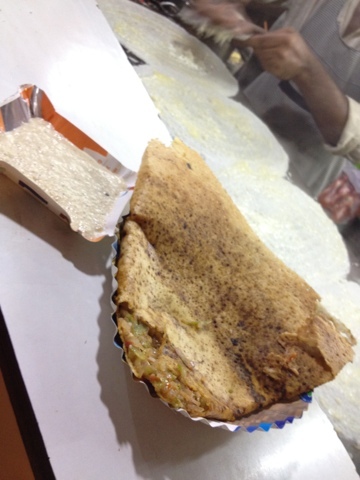 There are a lot of varieties of dosas at most Karnataka natives' houses differentiated by the contents of the batter. We probably make 10 - 12 different varieties on a regular basis. 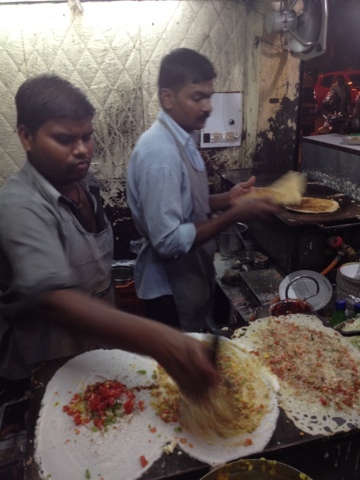 Really nice post, yes and like Intrepid Gourmand says homes in South India make so many varieties of dosa. I am a Keralite andas kids we would love the crips version of the regular dosa while my mom still has a soft corner for the small, thick and soft thattu dosa which tastes excellent even with curries. As you said it is really worth showcasing the different varieties, with so much of experimentation the blogging world has now come up with so many different versions of the dosa. Amazing how the same ingredients can taste heavenly with just a slight variation in proportion and some additions. Dosa and idlis are my most favourite food items specially when I am out of house. 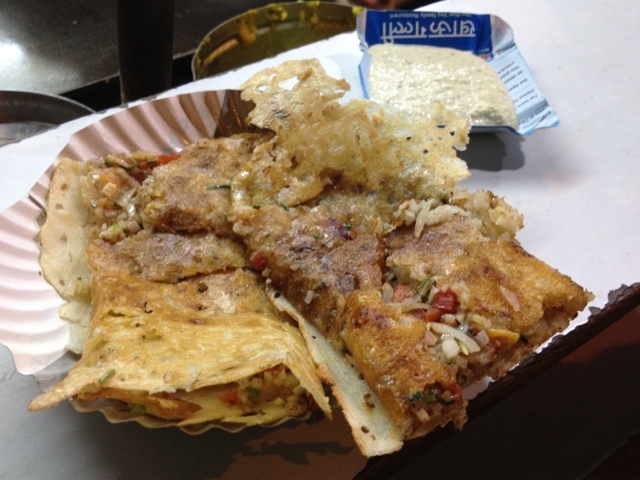 I like the crispy dosas like most other Bengalis. People have started selling dosas in carts at Kolkata too.